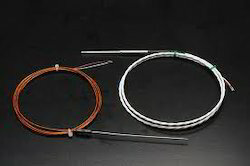 Prominent & Leading Exporter from Hyderabad, we offer resistance temperature detectors. We are a well known entity, involved in offering our prestigious clients high quality Resistance Temperature Detectors (RTDs). Resistance Temperature Detectors are best suited for most industrial measurements over a wide temperature range, especially when sensor stability Is essential for proper control. RTDs Generate varying resistance values corresponding to the temperature where in they are located. Our given temperature detectors are a device which used to determine the temperature by measuring the resistance of pure electrical wire. Looking for Resistance Temperature Detectors ?